We love to chat and share our news so join us on & . 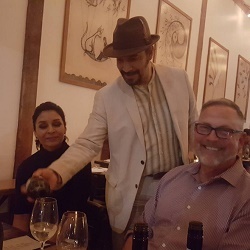 Our Tinpot Hut Sauvignon Blanc was poured on Friday at the 5 Courses, 10 Wines Sauvignon Blanc Day dinner at Marlborough's award-winning Arbour Restaurant. Hosted by Wine Marlborough with stunning photos by Richard Briggs, Fiona was present to chat about Tinpot Hut's wines. Liz, Bradley and the rest of the Arbour team ensured guests were well looked after throughout the night. Following on from the exceptional success of our 98 point 2016 vintage, our 2017 Tinpot Hut Sauvignon Blanc has been awarded a Top 100 Blue Gold Medal at the Sydney International Wine Competition in November. Judges Warren Gibson said ”Very attractive. Fresh and vibrant. Excellent wine. Lifted and pure with excellent richness and length...” and Brent Marris commented “Lovely bright green notes on nose following through to palate. Great acid balance with lovely tension coming through in the wine. Good concentration right through to finish." A wet winter was well and truly left behind as we enjoyed a dry and warm spring with Niwa forecasting warmer and drier than average weather on the East Coast for the next 3 months. While bunch numbers are generally down for Pinot Noir, the Sauvignon Blanc and other varieties are back to more moderate figures. We are currently experiencing perfect flowering conditions right across the region with hot dry weather. It is lining up to be a great vintage!. Yes that’s right!! 98 points and an ‘exceptional’ rating! 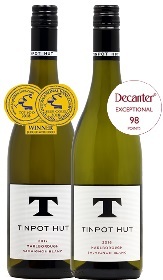 We are thrilled to announce that our 2016 Tinpot Hut Sauvignon Blanc came out tops at the recent NZ Sauvignon Blanc Vintage Release wine tasting held by Decanter Magazine UK. Up against 92 other Sauvignon Blancs the Tinpot Hut SB came out on top with a phenomenal score of 98 points. Judge Melanie Brown commented: "...A concentrated and poised amalgamation of complexity and style, effortlessly pure and well composed with nice phenolics and crisp acidity." "...The palate is fine and focused, and delivers excellent purity backed by mouth-watering acidity. Wonderfully harmonious and balanced and finishes superbly long and delicious." Sporadic and sometimes cold and wild spring weather interrupted flowering for some varieties and sub regions. Pinot Noir was particularly affected as were general yields in the Awatere Valley. A very windy summer led to broken posts and some challenges for canopy management. The temperature cooled as summer progressed and crop reductions were employed where necessary. Slower fruit maturation, lower yields and cooler temperatures led to some very intense flavours at relatively low brix numbers. Harvest began a little later than in the previous two years with our first fruit picked on the 1st of April. Rain during the month proved a challenge and condensed the picking window. The early work in the vineyards by our dedicated growers meant we finished harvest in mid-April. We are rapt with our 2017 Sauvignon Blanc and the white aromatic varieties of Grüner Veltliner and Pinot Gris are looking terrific. Our Pinot Noir is currently undergoing malolactic fermentation and is looking promising at this early stage. A stint in the US in early May was a perfect post-harvest treat for Fi. Her first week was spent with Copa Fina – our US importer and distributor for California. We visited San Diego, LA, Oakland and San Francisco. Week two was spent in Texas with La Cigale Fine Wines and Massachusetts with Gilbert Distributors. These are great companies and we are delighted to be partnered with them. Overall Fi met some fabulous customers and had a good reception to all wines at dinners and consumer tastings. We are excited to see new by-the-glass pours and listings coming through over the summer months. The only Gold Medal in its category at the Royal Easter Show Wine Awards 2017 went to our 2016 Tinpot Hut McKee Vineyard Grüner Veltliner. Huge shout out to our awesome grower Robyne McKee! We were delighted to support the Pride of Portland Chorus when they travelled around NZ in February/March. They started in Auckland, travelled through the North Island, and drove from Christchurch to Queenstown, Milford Sound. They sang in three performances with NZ Sweet Adeline choruses in Auckland, Wellington and Christchurch and in almost every restaurant they dined in to the delight of the other diners. The Pride of Portland Chorus is the premier womens' acapella chorus of the Pacific North West and is currently ranked in the top 5 Sweet Adeline Choruses in the US. Based in Portland, Oregon, the chorus draws from a rich reservoir of women from all over the Pacific North West. Our Tinpot Hut Pinot Gris, Rosé and Syrah were recently poured at an event hosted at the residence of the NZ High Commissioner to the Cook Islands, Peter Marshall. The event was for the big reveal of the beautiful Miss Cook Islands contestants. The Miss Cook Islands Association is a non-profit organisation and CITC Liquor supported this event showcasing our Tinpot Hut wines on the night. We received lots of positive feedback on our wines which we always love to hear! Many thanks to John and the CITC team for allowing us to be part of this event. Take a look at our whole wine selection at the Tinpot Hut Shop and read wine info including tasting notes in the Our Wines section. Shop online or email us to organise purchase. What a magic month! 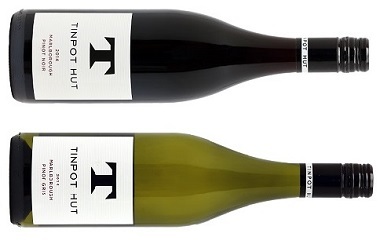 First up our 2016 Tinpot Hut Marlborough Pinot Gris won Elite Gold at the 2016 Air New Zealand Wine Awards at the end of October, then just recently three more of our wines were awarded a prestigious Blue Gold at the 2017 Sydney International Wine Competition - our 2016 Tinpot Hut Marlborough Sauvignon Blanc, 2014 Tinpot Hut Marlborough Pinot Noir and 2013 Tinpot Hut Hawkes Bay Syrah. Our 2016 Tinpot Hut Marlborough Rosé and 2016 Tinpot Hut Marlborough Sauvignon Blanc also won a Silver at the Air New Zealand Wine Awards. What a fantastic way to end the year! The earthquake that rocked the middle of New Zealand on 14 November, followed by a record rainfall the next day and subsequent aftershock earthquakes since have had a big impact on Marlborough, particularly for those in Kaikoura, Seddon and Ward, and on road transportation with the diverting of State Highway 1 through the middle of the South Island. We are very relieved and fortunate to say our staff and our growers are all safe and well, and their homes and businesses largely undamaged. We have had some negligible bottle and stock losses, but it's business as usual at Tinpot Hut. Our thoughts go out to those affected and we are supporting where we can. News in November was that we received three… yes, three Blue Gold Medals at the 2017 Sydney International Wine Competition! Our 2016 Tinpot Hut Marlborough Sauvignon Blanc, 2014 Tinpot Hut Marlborough Pinot Noir and 2013 Tinpot Hut Hawkes Bay Syrah have all walked away with Blue Golds. We knew they deserved it, but we're super excited that they've also been recognised internationally at this competition. Rapt with the prestigious Blue Gold Medal for the new vintage 2016 Sauvignon Blanc, the Blue Gold Medals for the 2014 Pinot Noir and 2013 Syrah continue the list of accolades for these wines. The 2014 Pinot Noir has now been awarded not 1, or 2, or 3, or 4 Gold Medals but an impressive FIVE Gold Medals, while the Blue Gold from the Syrah backs up the Gold Medal awarded in at the San Francisco International Wine Competition in July 2015. We were thrilled when our 2016 Tinpot Hut Marlborough Pinot Gris won Elite Gold at the recent Air New Zealand Wine Awards in November. Only one of 4 Elite Gold Medals awarded in the Pinot Gris category this wine is off to a fantastic start standing out amongst some of New Zealand’s best in the country’s most prestigious wine awards. Our 2016 Tinpot Hut Marlborough Sauvignon Blanc and 2016 Tinpot Hut Marlborough Rosé were also awarded Pure Silver Medals. Not a bad start for our new vintage wines! We are delighted to work with our new American importers, Copa Fina, who imported their first shipment earlier in the year. They are distributing our wine in Oakland, California, where Southern Hemisphere Wine Center in Huntington Beach also offer our Sauvignon Blanc online. We have also recently signed Gilbert Distributors in Boylston Massachusetts, 17th Street Distributing Company in North Carolina, and La Cigale Fine Wines in Texas. Copa Fina are currently importing our Sauvignon Blanc, Pinot Gris, Gruner Veltliner and Pinot Noir. Fi has just returned from a whirlwind trip to the US where she met with the teams of Copa Fina, 17th Street Distributing Company and La Cigale and is already thinking about the next visit! We are also excited to welcome Vinsight in NSW/ACT Australia, CITC Liquor in Rarotonga, and Rewine in Romania to our list of international distribution partners and are looking forward to working with them. See more on our Distribution Partners page. New Sauv Blanc a winner over the ditch! Whoop, whoop we've just heard that our newly released 2015 Marlborough Sauvignon Blanc has been awarded a Blue-Gold medal and Top 100 at the 2016 Sydney International Wine Competition (SIWC). In its 36th year the SIWC is the only international wine show that judges finalist wines in combination with appropriate food. Our Sauvignon Blanc is going great guns this year with the 2014 vintage taking away a Gold medal at the Speigelau International Wine Competition in July and being listed in the Viva Top 50 Wines in May. With its signature blackcurrant, lemongrass and fresh thyme flavours with a distinctive mineral palate, it's the perfect drop for summer (or any other season really). Grab some Tinpot Hut 2015 Marlborough Sauvignon Blanc today. Just in time for the warmer weather, our 2015 Marlborough Rosé is bottled and available to purchase. A new varietal for Tinpot Hut the Rosé is a crisp, vibrant wine with flavours of strawberry, stonefruit and a touch of spice ending in a long refreshing finish. 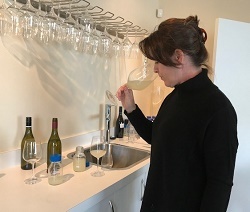 The Pinot Gris grapes for this wine were sourced from two vineyards in the Blind River sub-region of the Awatere Valley – the Home Block and neighbouring McKee vineyard. The Pinot Noir grapes were sourced from the well-tended, low yielding vineyards of the Home Block in Blind River as well as two vineyards in the Wairau Valleys. Bring on summer and grab your new release Rosé now. Just arrived in the letterbox, New World's Top 50 Wines - and our Tinpot Hut Marlborough Pinot Noir 2014 is there on the Gold list! One of just 8 in the Pinot Noir section to be awarded Gold, the Pinot Noir 2014 also recently won Gold at the Japan Wine Challenge and at the Spiegelau International Wine Competition. Read more about the New World Wine Awards. 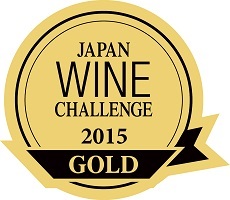 News just in that we have been awarded a Gold Medal for our 2014 Marlborough Pinot Noir at the Japan Wine Challenge 2015, along with a Silver Medal for our 2014 Marlborough Pinot Gris. Not bad considering we entered just these two wines. This is the second Gold Medal in quick succession for the 2014 Marlborough Pinot Noir - awarded Gold at the 2015 Speigelau International Wine Competition in July, along with a Silver Medal at the San Francisco International Wine Competition in June. Past Marlborough Pinot Noir vintages have also performed well with the 2013 being awarded Silver at the Sommelier Wine Awards in May, while the 2012 took Gold at this year's Sydney International Wine Competition and Silver at last year's San Francisco International Wine Competition. The Silver Medal makes it a trio for the 2014 Marlborough Pinot Gris, taking one out at the San Francisco International Wine Competition in June and the Royal Easter Show Wine Awards earlier in the year. Keep them coming we say! 2014 is turning out to be one bumper crop with not one but two of our wines receiving two Gold Medals at the 2015 Speigelau International Wine Competition. And, we were one of a select group winning Gold with our Tinpot Hut Marlborough 2014 Sauvignon Blanc one of only 9 awarded, and our Tinpot Hut Marlborough 2014 Pinot Noir one of only 13. For the Marlborough 2014 Sauvignon Blanc the Gold Medal adds to its 5 star and "Top Wine" rating in the December editing of WineNZ Magazine. Both the Sauv and the Marlborough 2014 Pinot Noir were also awarded Silver Medals at the 2015 San Francisco International Wine Competition in June. Sauvignon Blanc blending is now in full swing in the winery, with the Pinot Gris, Riesling and Gruner Veltliner close behind, while the Pinot Noir and Syrah parcels are happily tucked away undergoing malolactic fermentation. My impression of Vintage 15 is that of a very high quality vintage with intensity and weight in the wines right across the varieties and sub-regions of Marlborough. This is as a result of an unusually dry winter, a cool spring and early summer, followed by a warmer and drier than usual summer - naturally reducing the berry numbers and weights leading to a lower than average vine yield. Excitement is building around the overall quality of this year's Marlborough wines - we are bottling our white varieties this month - can't wait to get the wines into the bottle! Our Sauvignon Blanc is showing absolute classic characteristics, powerful and intense with the Blind River sub regional hall marks of blackcurrent bud, fresh thyme and passionfruit found in riper years. This vintage is showing excellent fruit weight due to low vine yields and the ideal ripening conditions experienced over the growing season. Natural balance, delicate fresh cut pear and brioche aromas combine to make this a lovely drinking experience, but one which will grow in texture with bottle age. Small volumes of Riesling and Gruner Veltliner are showing great promise, again with lovely natural balance from low yields and near perfect growing conditions. Our Tinpot Hut Hawkes Bay Syrah is going from strength to strength and we're chuffed that judges love the taste as much as we do. The latest in accolades is a Gold Medal for the 2013 vintage at the San Francisco International Wine Competition in June. This follows on from our 2012 vintage being crowned the Best Syrah and awarded a Double Gold Medal, and 97 points, at the same competition last year. The 2011 vintage was also awarded a Gold Medal at London's Sommelier Wine Awards in May. What an amazing run so far! The San Francisco International Wine Competition is the most influential wine competition in the United States and attracts over 4,500 entries each year. Judged by a renowned panel of nationally recognised wine experts, judging is based on a blind, consensual procedure, ensuring competitive integrity. Along with the 2013 Syrah Gold Medal, we were also delighted to be awarded Silver Medals for our 2014 Sauvignon Blanc, 2014 Pinot Gris and 2014 Pinot Noir. This is great news especially for the Pinot Noir which has just been bottled. Our Tinpot Hut Marlborough 2014 Sauvignon Blanc has made the Viva Top 50 Wines list. Described as "tight and focused with succulent stonefruit, notes of lime, herb and blackcurrent leaf overlaid with flinty minerality", it's enough to make you thirsty. Check out all the 5 Sauvignon Blancs. We have been awarded a Gold Medal for our Tinpot Hut 2011 Hawkes Bay Syrah and a Silver Medal for our Tinpot Hut 2013 Marlborough Pinot Noir at the prestigious 2015 Sommelier Wine Awards. Britain's only on-trade wine competition, the Sommelier Wine Awards have grown to become the first point of reference for the UK's on-trade wine buyers. Both award winning wines are available for purchase only in the UK through Liberty Wines, with the 2011 Syrah now a limited stock vintage. Other Syrah and Pinot Noir vintages are available through Tinpot Hut. The Syrah was described by the judges as "Elegant, clean, precise and pretty. Has great Rhone-style character coupled with New Zealand warmth. Very good length and Kiwi personality". The Pinot Noir was heralded as "Lean and elegant on the fruit and acidity but showing a lot for the money. Dark fruit on a meaty smoky nose. Perfumed violets combined with red currants and smoky undertones". These wines are further proof that our wines are consistently award-winning. The Tinpot Syrah has won gold or silver every year since the 2007 vintage was first released. In the latest Dish Magazine (December 2014-January 2015), Yvonne Lorkin matches the Tinpot Hut 2012 Pinot Noir with a delicious Duck Sliders & Asian Slaw recipe. She has this to say, "Something super-fruity is the order of the day here, so I'm hoping you'll try the Tinpot Hut Marlborough Pinot Noir 2012. Despite the light colour, this pinot doesn't cut corners on flavour. Bright raspberry, strawberry, cranberry and cherry characters lead to vibrant, spicy, oak complexity and a rich, satisfying finish. All-in-all, it's an incredibly drinkable, wine that could easily become a best friend." Check out Dish Magazine for more recipes. In his latest review, the Wine Guy, Gavin Hubble, has described our Pinot Gris 2013 as "beautifully vibrant and full, complemented by fresh natural acidity that gives this wine a lively, lingering finish". Of our Sauvignon Blanc 2014, he has this to say "good fruit acidity and a flinty mineral seam. The palate is medium weight, with good intensity and clensing acidity on the bright finish". Following on from Best Syrah & double gold at the San Francisco International Wine Competition, Cameron Douglas, Master Sommelier, gives our Hawke's Bay Syrah 2012 4.5 stars. "Everything works well with this wine - complexity and harmony seem to be a natural attribute; longish finish - well made." Our Gruner Veltliner 2013 & Pinot Noir 2012 have been described by Debbie Walton-Derry and Peter Morice in the Marlborough Express as having "exceptional personality". The Gruner Veltliner is picked as an excellent new varietal to try, while the Pinot Noir was dubbed as "very stylish and with enough bells and whistles to encourage cellaring for a few years". San Francisco International Wine Competition – Best Syrah, Double Gold, Gold & two Silvers! Hot on the heels of our recent success at the 2014 Sommelier Wine Awards in London, Tinpot Hut wines have continued on their winning streak at the prestigious 2014 San Francisco International Wine Competition with the Tinpot Hut 2012 Hawke’s Bay Syrah being awarded the esteemed Best Syrah, a Double Gold Medal and rated an incredible 97 points. A Gold Medal was also awarded for our 2013 Tinpot Hut Marlborough Sauvignon Blanc with 90 points, while the Tinpot Hut 2013 Marlborough Pinot Gris and 2012 Marlborough Pinot Noir were awarded Silver Medals. In its 34th year, the San Francisco International Wine Competition is the most influential wine competition in the United States and attracts over 4,500 entries each year. Judged by a renowned panel of nationally recognised wine experts, judging is based on a blind, consensual procedure, ensuring competitive integrity. Joelle talks with Fiona about “Groovy” Grüner Veltliner and her winemaking philosophy for the last few Tinpot Hut vintages. Great success overnight at the prestigious 2014 Sommelier Wine Awards held in London. Gold Medals were awarded for our 2013 Tinpot Hut Marlborough Sauvignon Blanc and 2013 Tinpot Hut Marlborough Pinot Gris while the 2012 Tinpot Hut Marlborough McKee Vineyard Grüner Veltliner won a Silver Medal. The Sommelier Wine Awards are the UK’s leading on-trade wine competition and are the only awards to be aimed solely at the on-trade. Judged by a top panel of leading sommeliers and on-trade drinks buyers, the competition rewards the best wines available to restaurants, bars and hotels in the UK. In describing the 2013 Tinpot Hut Marlborough Sauvignon Blanc the judges said “…the finesse with which the fresh apples and tropical notes blend with jasmine aromas and savoury notes impressed our judges. With its rounded sweetness, nice minerality and good balance… 'Quite charming!'”. 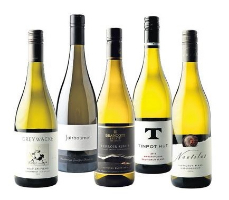 The 2013 Tinpot Hut Marlborough Pinot Gris was simply described as “… Elegance in a glass” while the 2012 Tinpot Hut Marlborough McKee Vineyard Grüner Veltliner was judged to be an “elegant, balanced white”. Fiona is delighted with the awards which further endorse the excellent quality record for the Tinpot Hut brand. Wines in the Tinpot Hut range are listed in some of London’s top restaurants, including The Providores, Plane Food, Gordon Ramsay at Claridges, Royal Exchange, Foxtrot Oscar, Maze, Bob Bob Ricard, and Crazy Bear Hotel. What looked to be an early fast harvest following an early budburst and warm spring has turned into a long and steady vintage. Several weeks of unexpected cloud and cooler temperatures in late summer delayed the start of picking; but Marlborough was back to its classic best in March, with warm days and cool nights giving us absolute control over our picking decisions. "@jamieoliver: @Tinpothut @Recipease glad you enjoyed love your wine buy the way always have some in the cellar have a great day"you too! 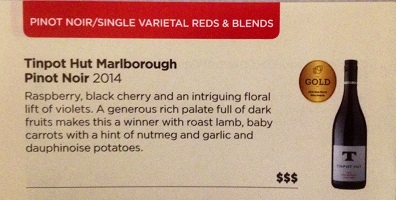 Just in today from the New World Wine Awards - a Gold Medal and Top 50 status. Another great result for this wine that just gets better and better! Now in its 11th year the competition saw a record number of entries with 1,099 wines entered from 157 wineries that were judged by an independent panel of 13 international judges. We submitted one wine - our 2012 Tinpot Hut Sauvignon Blanc. This was one of just 11 Sauvignon Blancs awarded a gold medal and top 50 status. This is what the judges said: "Crunchy green bean flavours highlight the spicy herbal flavours with a nice balance of lime flavoured acidity. Great with Japanese sushi and sashimi, seafood based steamed dim-sum or air dried ham such as prosciutto."